When you give a gift certificate, the recipient can choose baby or maternity products that meet her needs, as well as receive 5% of the redeemed value towards doula or midwifery services, allowing her voice to be heard and her choices respected during pregnancy, birth, and postpartum. 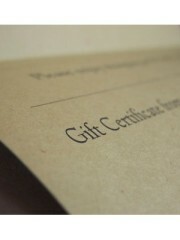 After we receive payment, we will send you an e-mail notifying you that your gift certificate is ready. Then, simply login to your account, and transfer a portion or all of the gift certificate amount to the person of your choice.